Ironmongery Experts have a selection of high quality Hooks, ready for both commercial and domestic needs. These designs are the perfect way to ensure outside clothes such as hats and coats are stored in a practical manner, allowing easy accessibility at all times. We have conventional coat hanger racks, which are perfect for offices or households with families. The practical designs have 5 or 6 hooks, with traditional plain wooden or white finishes. We also supply single hooks for smaller rooms and spaces. There is the plain and simple Anvil medium cup or a pack of vibrantly coloured Equestrian General hooks. Ensuring rooms at home or work are properly ventilated is also paramount to achieving optimum productivity and wellbeing. We have a wide range of Ventilation products that are all designed to an exceptional standard for high quality and long-lasting endurance. Ironmongery Experts also have a selection of Safety products to keep anything safe and secure within your household or workplace. Having a Fingershield covering straight and sharp hinges is crucial for the safety of people opening doors. Our products are the perfect way to ensure young children don’t get their fingers trapped. We also have a fun and dynamic range of Cupboard Knobs and Handles. These exciting and vibrant products are the perfect way to add life and colour to appliances and hardware in any of your rooms. Many of our designs are guaranteed to be a huge hit with the kids, especially the Cebi Joy Snail Cabinet Knob model. People also need a place to store and keep their outside clothes such as hats and coats. 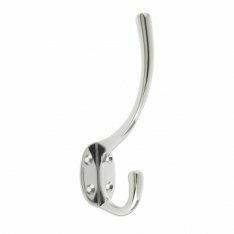 We have a range of Hooks that are suitable to hold single or numerous items. Households or offices with an array of people will need a coat rack such as our 6 Hook Satin Chrome design and smaller places would be ideal for our Anvil Small Cup Hook.